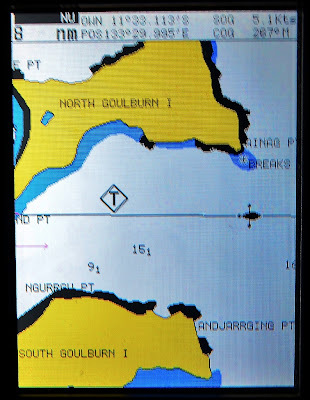 In the early morning hours, before the day begins, I steer AR through the passage between North and South Goulburn Islands which are part of the traditional lands of the Arnhem people. The passage though not marked is wide and deep with only a couple of contours marked at 7-8mts on the chart plotter. I could see the bright lights of a trawler up ahead; assuming that this trawler was anchored inside Sand Point, the southernmost point of N.Goulburn Island, but not really knowing so I gently woke MrJ from his peaceful sleep on the cockpit cushions, as per instruction on seeing anything out of the usual. MrJ as the Skipper took over the helm, as was his right and who am I to argue, I’m just the Admiral. 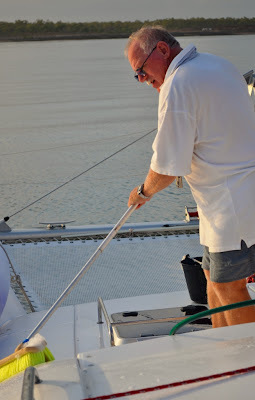 MrJ and I had been reading about the anchorage in Mullet Bay N. Goulburn Island as per the Guide to Cruising Northern Australia – Anchorages Cairns to Darwin but opted for the anchorage in South West Bay S. Goulburn Island as per the note from our mates Craig and Kerry off Scarlett. There was a slight NE wind and rolly swell still present which would make the northern anchorage untolerable. During the day the slight breeze did turn more northerly but not uncomfortable enough for us to be thinking about moving on. Hey – we survived the bouncing around in Bathurst Bay and that is now my benchmark. Anyway, by nightfall the wind died and the sea settled to give MrJ and I a wonderful peaceful night’s sleep. As MrJ coasted AR into South West Bay the fiery pink of the morning light of the new day was welcoming us to another island in the heart of the tradition Yolngu people. Once again it intrigued me to spy what I thought were a couple of buildings ashore which in the daylight turned out to be a couple of tanks, a cement truck and a backhoe close by a barge landing ramp. The barge did come in later that day. The traditional owners reside at Warruwi on S. Goulburn Island. Warruwi has a population of 415 residents and is situated on the eastern side of the island. It is a dry community and fishing is the main past time of the local people who are allowed to hunt the turtles and dugong prevalent in the area. 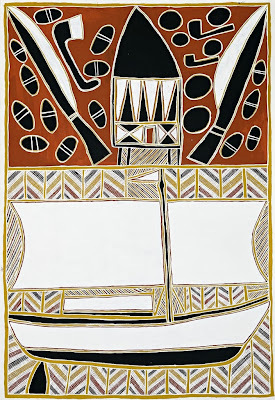 The Mardbalk Arts & Craft Centre is located on S. Goulburn Island. Mardbalk Arts supports artists from the communities of Warruwi (Goulburn Island) and Minjilang (Croker Island) who are proud Saltwater People. 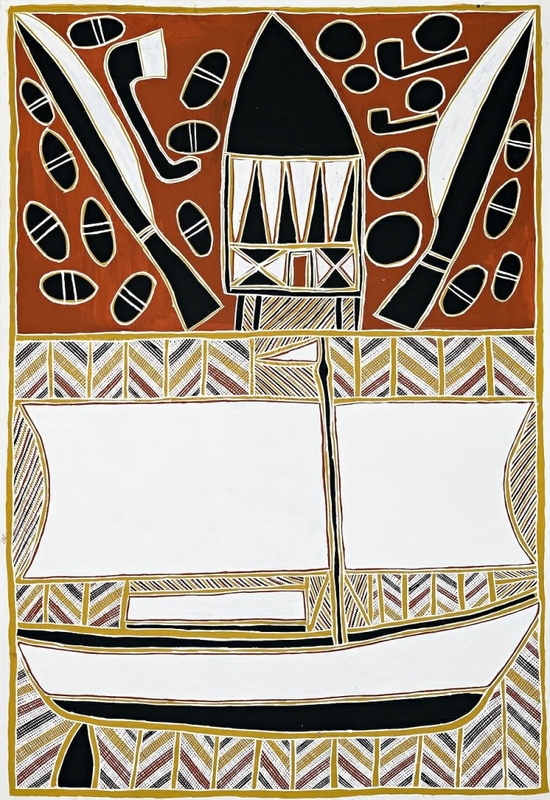 Their artworks consist of beautiful pandanus fibre art, timber carvings, shell jewellery and both traditional and contemporary canvas and bark paintings all inspired by the saltwater scenery and wildlife found around these unspoilt islands. MrJ and I did not have a permit to go ashore even though we have been told that even without authorisation the passing yachtsman can, out of necessity, call into the townships of Arnhem Land to replenish supplies. It didn’t feel right to invite myself besides I know that the extreme isolation of these coastal settlements sees them serviced primarily by aircraft and barge. Rather than stretch what must already be limited resources, I preferred to stock up in advance, which I did in Cairns. When we sailed out I did leave feeling a little disappointed at not being able to communicate with the Warruwi people. Once MrJ and I had set the anchor and dropped the covers we, with our newly acquired passenger still asleep, sat up front sipping on our cups of tea to watch another magical morning’s sunrise unfold. The beginning of the day stirred the natural senses in the Booby birds body; it stretched its neck flapped its wing then looked around at these strange new surroundings. 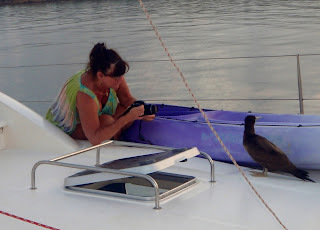 I felt so privileged to be allowed the pleasure to be in such close proximity to this beautiful wild creature; so close that I was almost tempted to touch the Booby but I did refrain. 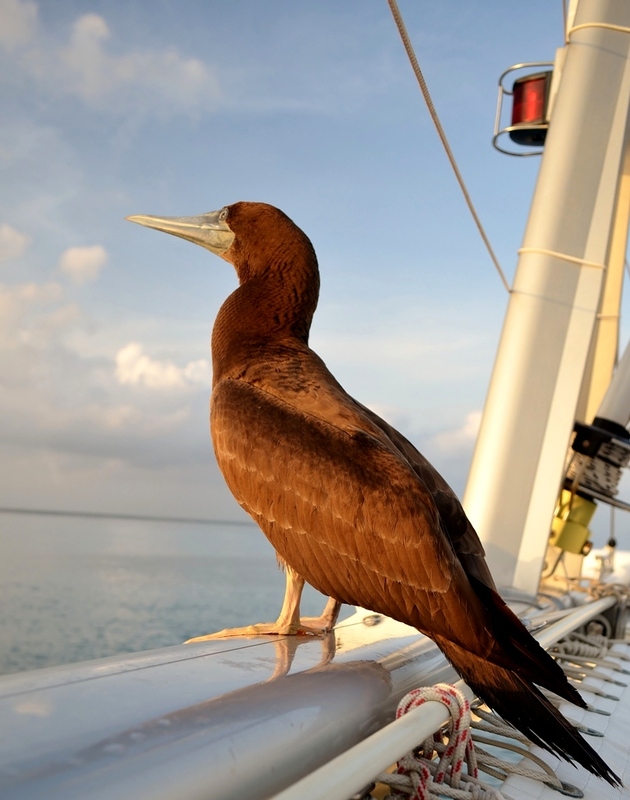 This young Booby gave me the impression of not having had previous contact with a human; the Booby was not afraid of us or the boat. Goodness knows what impact on the Booby’s life it would have made; carrying our scent might alienate it from its own kind. Nature can be so cruel at times. 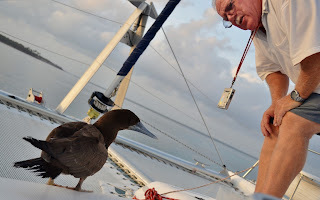 MrJ was forced to give the Booby a little shooing to encourage it on its way and with this the young Booby flapped its wing, dipped into the water from the bow and in one great flap of its wings took to the sky with a low sweep across the sea. The Booby did not go without leaving behind a trail of evidence that it had been on board. MrJ had a little cleaning up job to as well as wash off some of the fine red dust from Gove that was still lingering on the decks. As we anchored in the pre-dawn light we did notice the lights of two other boat already anchored in South West Bay. One, a motor boat that left in the morning light, the other, once it was light enough to see, turned out to be an Australian Customs boat. They had been watching us! After we had finished our cleaning and putting away ropes and lines, MrJ has just sat down to have our breakfast in the cockpit when there was a squawk on the radio and you guessed it, it was Customs doing their usual check up. 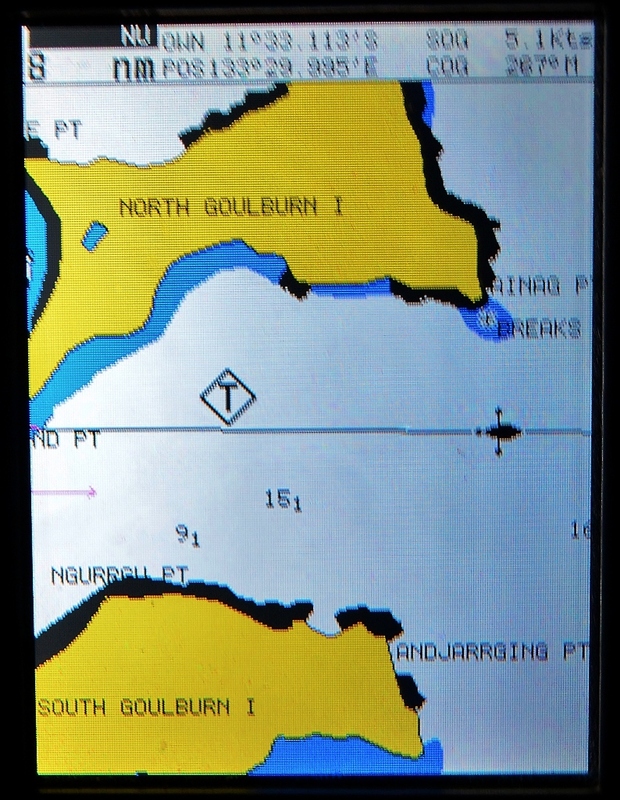 MrJ and I do learn later from the National Park Ranger at Port Essington that Customs had been on the lookout for some illegible happenings, an Indonesian boat that had been reported around the Top End. MrJ answered the call, handling all the official questions and then some time later after MrJ had gone down for a sleep (he must have been in a deep sleep) I received a second call from the Customs boat. 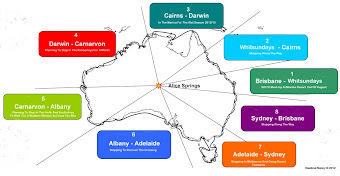 The voice on the other end was a different person asking some of the same questions but his main concern was the call sign number that we had given did not match the one in Canberra. I gave the Customs officer the correct number and he apologised for their mistake, had been written down incorrectly or a typo error and then we signed off wishing each other a good day.